The techniques we train in our dōjō are based on bujinkan ryū-ha traditions. Yet we sometimes get in touch with shurikenjutsu training from other schools or martial arts (for example Meifu shinkage-ryū) to improve our knowledge. Our training lessons are focused on effective techniques of blade throwing and their usage at close distance. We prefer ways of throwing/movement that can be used to solve dangerous situations quickly and effectively, as it is taught in traditional martial arts. Most of our lessons are focused on precise exercising of basic throws in various positions and actions (falling techniques, walking, running). Everything is based solely on experience gained from training led by Japanese teachers or teachers studying in Japan. 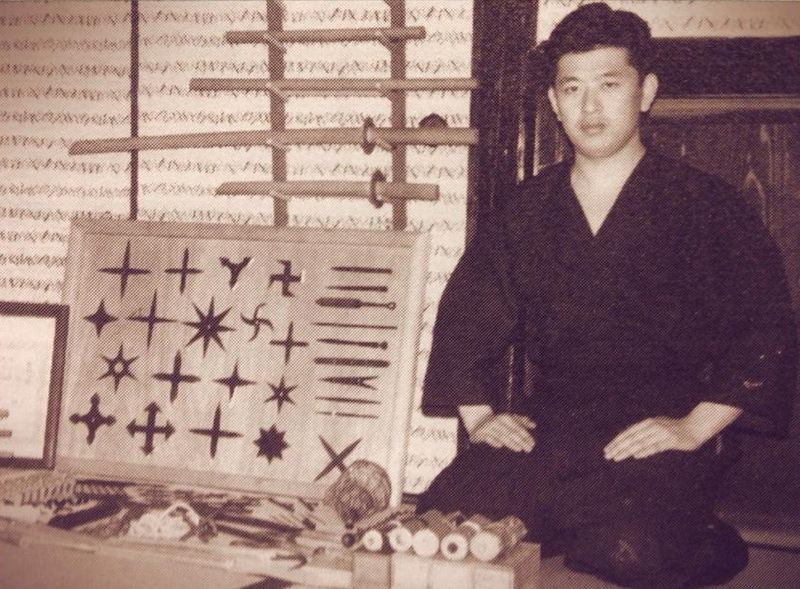 Hatsumi sensei and part of his collection of shurikens and various denshō. Find a way to control the position of your shuriken’s blade during its flight. Should you gain this ability, your shurikenjutsu will become powerful. Henka waza 変化技 - other throwing techniques such as Ichimonji uchi 一文字打ち, Jūmonji uchi 十文字打ち, and more. We start in Shizentai 自然体 or Shinzen no kamae 自然の構え position, that means from a common stance. We have a Shuriken 手裏剣 prepared in our right palm, point facing forward. We continue with a left step forward and simultaneously move our right hand to the side of the head in such a way that the blade cannot be seen from a front view. With a rapid twist of right hip forward we swing our right arm diagonally in front of our body so that the right arm “falls” down to the left hip. In such movement the shuriken is released from our hand due to the centrifugal force and flies to its target. We start in Shinzen no kamae 自然の構え position. We have a Shuriken 手裏剣 prepared in our right palm, point facing forward. We continue with right step forward and simultaneously move our right hand in front of our body over our left shoulder. We rotate the palm outside and with a rapid twist in hips we swing our right hand so that it “falls” down to the right hip. In such movement the shuriken is released from our hand due to the centrifugal force and flies to its target. A student should always follow the basics which are built upon taijutsu movements. The right hand uses the same movement as during Ura shutō ken 裏手刀拳 punch. In this technique, we start in Shinzen no kamae 自然の構え position with a Shuriken 手裏剣 prepared in our right palm, point facing forward. We continue with a right step backward to Shōshin no kamae 初心の構え position where the left arm is stretched in front of the body and the right hand with shuriken is down next to the right hip. Then there is a right step forward with a rapid swing of the right hand diagonally upward to the left shoulder. In such movement the shuriken is released from our hand due to the centrifugal force and flies to its target. It is also possible to throw in this way without the step forward, just with the hip movement. The motion of throwing arm is the same as in the basic version of this throw. In this technique we try to accomplish the same movement and feeling as in Gogyō no kata 五行の型, specifically its first technique, Chi no kata 地の型. Another thing, crucial for mastering the right throw, is to learn how to release the shuriken at the proper moment. And the only way to do this is to train regularly and hard.